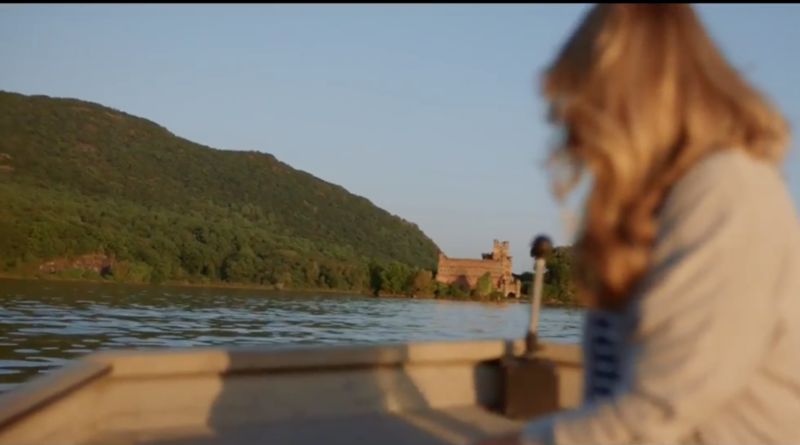 A still from a recent Chase Sapphire ad, starring Jillian Fisher and Bannerman Castle. 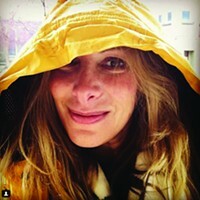 At the age of three, Jillian Fisher moved from Queens to Kingston. Now a resident of Woodstock, Fisher has long appreciated the Hudson Valley's natural and architectural beauty, which she aims to share with the world through her work as a location scout. In a recent Chase Sapphire ad (below), Fisher said, "As a location scout, I've pretty much covered the mysteries of the Hudson Valley. I've explored the back-roads, the in-roads, the places with no roads. But somehow it's still full of surprises." On an early September afternoon, we sat down at Rough Draft in Kingston to talk about her work, the film industry, travel, and the Hudson Valley. About six years ago, I had a boutique PR company. At the time, the City of Kingston was one of my clients. A movie crew contacted the city saying that they were going to either film in Kingston or outside New York City. I spoke with location manager and asked her to tell me about script, and as she was talking about it I started filming it in my head, saying 'check, check, check.' So the director and location manager came up to see how Kingston would stack up. That movie was The Sisterhood of Night, starring Georgie Henley, from the Narnia trilogy, and Kal Penn. Then I worked on Cold in July, and after doing that I decided I really enjoyed this work. What other Hudson Valley movies have you worked on? Yale Productions is a major film company; I’ve done five films with them. The most recent is called Crypto, it’s in post-production now, starring Kurt Russell. I also worked on Growing Up Smith, which is just the sweetest film, starring Jason Lee, about an Indian family that moves to America in 1970s. The parents struggles with raising children and wanting them to assimilate but not too much. How do you get your scouting gigs? Unlike a lot of people in the industry, I’m not on any lists. I only work through word of mouth. Anyone who gets in touch knows my reputation. So they call up, and I say, “Tell me about film,” then I ask them to send me a script. The location scout is usually one of the first five people brought on to movie, many times even before they’re finished casting. What is your coverage area as far as scouting goes? I am a scout for Hudson Valley but in broad sense—from Westchester up to Columbia County and on both sides of river. The last movie I worked on was down in Putnam Valley. How has the recent Film Tax Credit Program affected the film industry? Are you seeing an uptick in movies being filmed here? The film tax credit existed even when I started, but in the past few years it was just increased by an additional 10 percent, which makes a big difference. The films I work on are generally what one calls “low-budget indie films.” They all go the film festival route, hoping to get picked up for distribution. For example I worked on Olivia Wilde’s A Vigilante, which they just announced at the Toronto Film Festival was picked up by DirecTV. Have you worked with celebrities? I’ve worked with celebrities on a few pictures. I sometimes help find lodging for people. The most down-to-earth, most solicitous celebrity I met was Michael C. Hall (“Dexter” and “Six Feet Under”). He was genuinely just a really nice guy. Take me through your process. I read the script. It’s very easy to get sucked in, but I have to make sure while I’m reading it, I’m filming it in my head to get a feel for where the destinations are going be. Then the next day is filled with coffee as I drive around. Before I hit the road, I try to speak with director, and say, “This is how I read it, this is how I see things,” just to make sure it jives with their vision. I’ll say things such as, “I read this location as background, something you don’t want the viewer to notice, should be anywhere,” or “It seems to me that the house is a character unto itself.” And they’ll confirm my thoughts or we’ll discuss further. I scout in concentric circles. There is this idea of the magic hour—as soon as the cast or crew leave hotel, they’re on the clock. When budget not that big, they don’t want to waste budget on travel time, so I try to find the nucleus and go out from there. My priority is always what is filmed first. The producer and director want to know that their first locations are secure—not necessarily in script order but in filming order, or even wherever the majority of their scenes will be taking place. I also use social media a lot when I’m doing thi. I’ll put a message on Facebook and say “location needed” because oftentimes local people come up with things that will either confirm what I was thinking or recommend something I forgot about. And sometimes a beautiful picture on Instagram will make me want to go explore a place more. How would you describe your role within the scope of a film crew? My job is to bring the director’s vision to life. They provide descriptions of locations in the script, but there is just as much information in the subtext. It’s knowing whether the location is background or a character. I did a movie with Yale Productions called Welcome the Stranger, starring Riley Keough, and the whole thing was filmed in one house—that house was a character. Sometimes finding one location can be as difficult as finding more than 20, which I’ve had to do. Do you pitch the Hudson Valley as a location or do people come to you? Yes and no. Producers I’ve worked with before will sometimes say, “This director wants to film out in Colorado, we want him to film in Hudson Valley. Can you take him out?” I’ve done that before and gotten them to change vision. I’ve made a road trip “across the country” happen in a 20-mile radius. What do you look for in a location? Every time is different. I try never to reuse a location and always present new things, but sometimes directors have been sitting with project, envisioning it and they want something specific. There’s a stone church on Albany Avenue in Kingston that was featured in both Sisterhood of Night, and Andie MacDowell’s Love after Love. Tell me more about this filming in your head. I’m an extremely visual person. And my background in communication and PR doesn’t hurt because I have a very high level of attention to detail. I take pictures constantly. I’ll be going past something and I’ll just think, huh, that would look stunning on screen. What qualifies as stunning to you? Visually stunning can mean many things. It can be something a typical person might not think is beautiful—could be a junk heap—but on screen it might look amazing. Many location scouts just have files of locations so that when somebody gets in touch they can send pictures right away. I don’t send pictures of anything that I don’t already have permission to film on. Don’t want to get any director’s hopes up. Does the Hudson Valley have filming niche? Are we being typecast? Not at all. That is one of reasons why out of gate I’ve been so successful—The Hudson Valley can be anywhere. For Growing Up Smith made it India. Since these movies are low-budget indie features don’t have budget to go do b-roll in India. When I’m scouting have to be on lookout for details that make a scene work. There was specific foliage in Kingston that worked for the India flashback scenes in the movie. This is where director and cinematographer have to work with me to help me help them. It looks great. Quite often when I location scout, I just knock on doors. I was driving in this one neighborhood when I was scouting for Crypto, and I saw something out of my peripheral vision. So I literally backed up and went and knocked on this door. When I walked in, I just knew. The next day, I said to one of the producers, “I’m taking director and cinematographer to this house and they are going to choose it. What do directors love about the Hudson Valley? Everything. The cast and crew are always house hunting when they’re here. They always fall in love with it. A couple years ago my family and I travelled across country to California, and you see how brown a lot of country is. Then you come here and everything is so lush. Whether come from LA or from the city or Brooklyn—the Hudson Valley has everything you could want. Have you ever gotten star struck? Are these scouting skills useful in your personal life? Yes—outside of randomly knocking on people’s doors, this is something everyone can apply to everyday life. 2. Don’t be afraid to back up. 4. Take lots of pictures. Most people don’t even notice their immediate surroundings. They get into routines. They get on auto pilot. I tend to see things from an outside perspective. I try to find unique qualities in the everyday. My family and I drive a lot of places, and we always allot time between to explore along the way, because that is how we find the places that are worth going back to.